Nokia reveled E52 , the next addition to Eseries multimedia and mobile productivity devices . 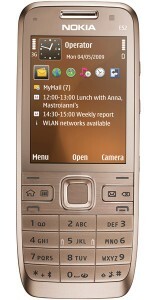 Nokia E52 is just like Nokia E75 which don’t have a slideout QWERTY keypad . Its introduced with tight integration to social networking sites like Facebook ,Myspace , Youtube ,Twitter and more . E52 is the first Eseries phone which is expected to be with more than 8 hours of talk time . The phone adapts standard candy bar design with common phone keypad . Checkout Nokia E52 features , price and specification . 320×240 2.4 inch QVGA display . Integrated FM and 3G radio . GPS receiver ,WiFi and Bluetooth with A2DP . Upto 8 hours of talk time . Inbuilt quick access to Facebook ,Myspace , Youtube ,Twitter and other social websites . Nokia E52 price will be around 350 USD . I think Nokia E52 is a business phone Particulary it's batery time is amazing up to 23 days stand by time . It can be also integrates seamlessly with corporate telephony systems, effectively complementing or replacing the need for a desk phone which is great . i want 2 bye these nokia e 52 ,I am living in mumbai. give me contact nos. of the shop. and what is the price. Rs_ _ _ _ /- . where i can get easily ……….. I wanna buy either e55 or e52 ?? Which one is the best?? Let me know the prices of both the models in INR. pls don’t buy this mobile u will be suffring from it.